Cramming a full Windows PC inside of a cheap, $150 HDMI dongle sounds like a great idea—but Intel’s first attempt really fell flat. The Intel Compute Stick was underpowered, frustrating, and failed to live up to the hype. It wasn’t good enough to be a do-everything PC that fits in your pocket. No sweat: a leaked Intel roadmap shows how it’s going to get a lot better. 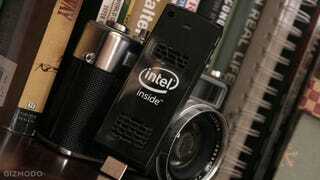 The current Compute Stick has underpowered Intel Atom processor, only 2GB of RAM and needs an external power source (your TV’s USB plug) to boot up. The next version won’t: Later this year Intel apparently plans to introduce a Compute Stick running a more powerful Core M-based CPU with 4GB of RAM, 64GB of internal storage, USB 3.0 ports and support for 4K displays. It’ll also have MHL support, meaning the stick will be able to draw power directly from the TV’s HDMI port. Fewer cables, less fuss. Sounds good. Intel is also working on a new Atom-based Compute Stick using its next-generation Broxton architecture, which promises all of the same perks as the Core M model, but less performance and the same 2GB RAM restriction as the current model. If Intel Atom is your preferred flavor though, you’ll have to wait: that model won’t be out, apparently, until early 2016. All in all, it’s good news for folks that found the original Compute Stick to be underwhelming. More importantly, it shows that Intel is serious about pocketable PC platforms.